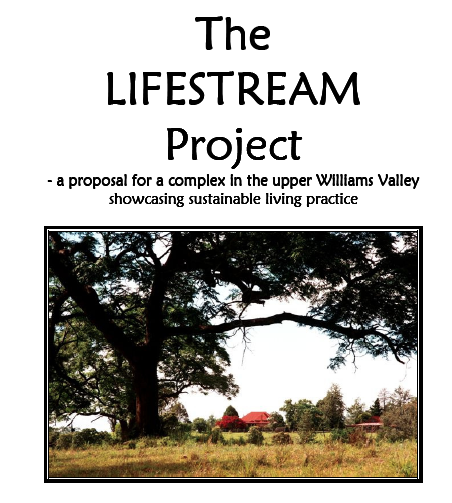 The LIFESTREAM project is Ken Rubeli’s proposed complex showcasing sustainable living practice based around historic Munni House and surrounding lands. Ken Rubeli is a Dungog environmentalist and educator and was prompted to develop the project by Hunter Water Corporations’ AECOM consultancy re plans for land purchased for the now defunct Tillegra Dam. This consultancy will publish its final report later in 2013.
but at last the NSW government has landed somewhere sensible. avoided six years of anxiety and uncertainty. only be considered after all other options have been exhausted. massive damage to the Williams River and the Lower Hunter wetlands. populations are in long term decline. values, but to protect the future of the fishing and prawning industries. dams are now off the table," Dr Kaye said. the Lower Hunter Water Plan? the region as part of the plan. have their say in the Lower Hunter Water Plan's processes.